Although not the first demo slotted on the convention schedule, the one drawing the most intrigue was reserved by a game with no name. 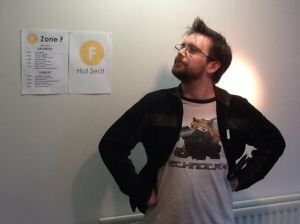 As an exclusive for AdventureX, Wadjet Eye revealed their new project, Shardlight, to an eager gaming audience. To those who, like myself, keep an eye on the freeware scene, the look of the game was not entirely unfamiliar. 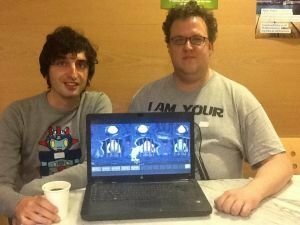 Back in July 2013, Francisco Gonzalez and Ben Chandler, both now employed by Wadjet Eye, jointly entered two games in an AGS One Room, One Week competition. Those games were The Rebirth and The Reaper, respectively presenting the day of apocalypse and a post-apocalyptic world. It was stated at the time that the games represented vignettes from a greater whole, and now that promise is about to come to fruition. The point-and-click game is set in the post-apocalyptic world of The Reaper. Reading aloud an intro to be used in the final game (and acknowledging the Fallout series as its inspiration), Francisco described how the end came and what happened after. The bombs fell and the city was decimated. For a while everything was in disarray, but in time a new government came into power, The Aristocracy. Represented in the demo by the campy but threatening Caligula, the new authorities treat those below them largely as tools to be used and discarded at will. They also control the only cure to a deadly disease that has risen in the aftermath of the fall. When they need a particularly unpleasant or dangerous job done, they offer prospective workers not the cure itself, but tickets for a lottery to win some. It is in carrying out just such a task that we first meet the protagonist in the demo. A young woman, later identified as Amy, is first seen entering an unstable tunnel complex to fix a malfunctioning reactor. The crumbling tunnels are rendered in finely detailed pixel art, the hazard clearly evident by a tunnel roof half-collapsing early on. The brutality of the setting is also driven home when the heroine finds that she is not the first to be sent on this mission, though her predecessor is barely alive when found. The demo was well voiced with expressive character portraits, as we have come to expect from Wadjet Eye. The demo included only a handful of puzzles, well integrated with the story and pleasingly inventive. 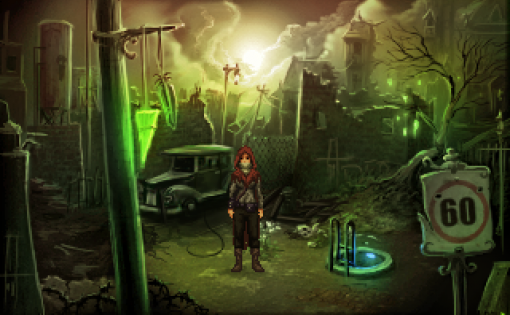 Given Wadjet Eye's usual standard of quality and the talents of Gonzalez and Chandler behind it, Shardlight already looks to be in very good hands, and one to keep a close eye on in future. Back in October 2010, a game was released by an AGS developer known as Technocrat. Promising to be the first episode of a new futuristic cyberpunk series, Technobabylon Part 1: The Prisoner of Fate crammed a lot of puzzling into a game taking place in a small single-room flat (inspired by the developer’s home at the time in Korea). The resulting tale of a VR-addicted woman, Latha, trying to repair her lost connection proved quite compelling. Two more episodes were released as freeware in the following years, expanding on the futuristic world setting and introducing a second playable character, law enforcement consultant Dr Charles Regis. Now Technocrat, also known as James Dearden, has linked up with Wadjet Eye Games to make Technobabylon the epic sci-fi commercial adventure it always seemed capable of becoming. The essence of the original three episodes will carry over into the new game, with most of the overarching story intact. Latha still suffers from addiction to the virtual reality world known as Trance. Similarly, Dr Regis is still pursuing a serial killer whilst being blackmailed into misusing his position. However, Dave Gilbert has used his experience to streamline the plot, so that the overall story arc works better. Some minor scenes have been cut entirely, whilst others have been modified to suit the pacing and coherency of the story better. Knowing that consistency is key in a fully voiced game, Dave has also pinned down pronunciations, such as the correct way to say “Latha” (which is “Lah-tha”). The graphics have seen a significant upgrade from the low-resolution originals, and Wadjet Eye’s Ben Chandler has played a significant role in this improvement. Though it will be released as a single game, the final product will be split into twelve chapters. Eleven of these are set in the game’s present day, with the other set twenty years prior. With production already well along, we can expect this tale to be finished in the not-too-distant future. Projected for release early next year, you can discover some behind-the-scenes insight into the game at the developer's blog. In the land of Iesir, the grand council are concerned about the threat of invasion by the Vikings, who have been launching attacks all along the coast. Even small coastal towns of no apparent importance have not escaped their raids. Meanwhile, in one such coastal town, a young playwright named Michael has received a commission. He believes that his new patron simply wishes him to research material for a new play. Little does he know just who his new patron is, and how his seemingly simple commission may hold greater import than he realises. 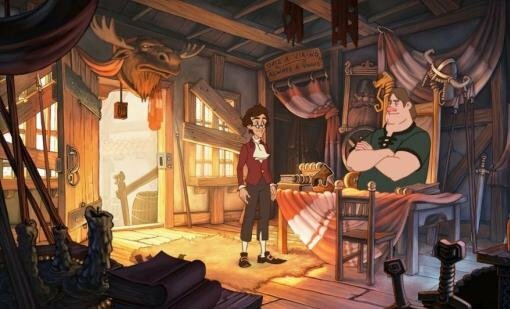 The hand-painted graphics of A Playwright's Tale have a fine semi-realistic style, which has attracted some not-unjustified comparison to a higher resolution version of The Curse of Monkey Island. After a cinematic opening cutscene showing the far-off council’s deliberations, the demo dropped me into a wood-beamed house, with sunlight streaming through the door. There is a wealth of background detail and decoration in each scene, a quality that has carried over to characters like the young but studious-looking protagonist. The voice acting I heard was also well done, though completing the voice-overs is the main outstanding issue holding back release at this time. A standard point-and-click interface is used, with the opening scenes simply involving acquiring the items needed to get started on the commission. The artistic temperament of the player character came through in this, with his tendency to use grandiose speeches to describe even junk-filled back rooms. If the plot and look seem familiar but the name does not, that’s because the game was originally titled The Journey of Iesir before being renamed. Indie developers Dream Cauldron acknowledge that their game has been in production for quite a while now, but the project is now on track for an episodic release beginning in early 2015. The game is to be released in four instalments. Whilst only holding limited information at present, the developer’s website should provide more details as the launch approaches. 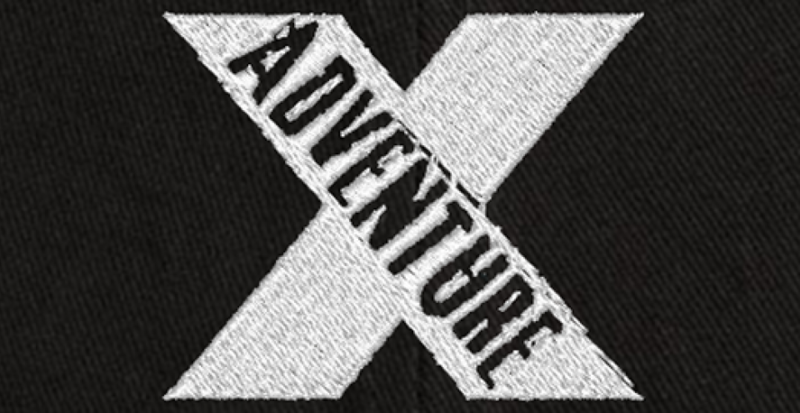 The point-and-click tale of brutish denizens of the dark, Troll Song, was originally announced way back at AdventureX 2012, with a freeware demo made available in January 2013. Whilst originally intended as a freeware episodic series, developers Team Disaster have been encouraged to turn the game into a single commercial venture instead. The first chapter will be released as a free replacement demo in early 2015, with the rest of the game coming out in the third quarter. The game tells the story of a group of four trolls as they try to avert the extermination of the troll race, which is far more civilised than one would expect from their outward appearance. The retro pixel art style of the original concept has largely been retained, with the opening scenes from this year’s demo looking familiar to those who played the first iteration. The lead character, Clod, is still a hulking grey brute with a protruding brow and a heavy way of moving. However, the graphics have been given a subtle upgrade that improves the look, making better use of shading to give the 2D drawings a real 3D feel. The opening free episode will only have three locations in total, but they will be wide-scrolling areas that still provide a decent amount of territory to explore. Whilst Team Disaster's Dave Seaman boasted that his own silly voices from the original were praised by at least one eager fan, the voice-overs have been redone for the new version and do represent an improvement. The game will also have a UHS-style hint system, starting players with a subtle push before working up to full instructions if they get stuck. Further information, screenshots and other material can be found on the game’s website. Oh man, now our report is a disaster! But updated accordingly. Anecdote time. At the end of each day there was a raffle. All those taking part were encouraged to bring along prizes, both good and “pants” Having grabbed what I had to hand that was vaguely related, my offerings were definitely in the latter category. Day one raffle and I have tickets 1 to 5. The tickets are drawn and one by one people pick prizes from the table. Eventually only my rubbish prize for day one is left, to be followed by the big bag of goodies that is always drawn last. The ticket for,my prize is drawn and it is 1. I make a joke of collecting my own prize, because I’ve still won, right? I’m asked to draw the big bag ticket, and do a big show of digging around in the ticket bag, followed by an elaborate sweeping gesture to maintain the tension. As it comes to rest in front of my eyes and the microphone is put in front of me I see the number. It’s 2.